Jaguar I-Pace Performance, Engine, Ride, Handling | What Car? The I-Pace has four-wheel drive provided by two electric motors: one at the front and the other at the rear. Together, they pump out 395bhp, which is enough for 0-60mph in 4.5sec – slightly slower than the Tesla Model S, but significantly faster than the vast majority of cars, electric or otherwise. In addition, and as with all electric cars, maximum torque is available from the minute you press the accelerator, instead of you having to wait for the revs to rise to a certain level, as you do with a petrol or diesel engine. As a result, there’s virtually no delay between you putting your foot down and the car surging forward – something that helps the I-Pace feel even faster than the figures suggest. A 90kWh battery pack gives an official range of 298 miles on a single charge – again, surpassing most other electric cars. And in our Real Range test, the I-Pace managed 253 miles, which is more than almost every other electric car we've tested, including the Tesla Model S and Model X.
Happily, the standard (passive) suspension is good enough to mean you don't have to splash out on optional air set-up, at least with the smallest-available 18in wheels that we've tried. It smothers the harshness of most bumps, whether you're moseying around town or belting along an A-road. Our only criticism is that, being similarly heavy but taller than the Model S, the I-Pace finds it trickier to control its mass. It bounces vertically over crests and sways more from side to side over uneven surfaces, but is by no means uncomfortable. Those same movements are discernible even with the optional adaptive set-up in its softest Comfort mode, but here you can flick the suspension into a firmer Dynamic mode that tightens up the body control somewhat. On the downside, that has the consequence of transmitting road imperfections through to the interior as thuds, whereas in Comfort mode, you’ll find that even an I-Pace on big 20in wheels can absorb initial impacts better than a Model S.
Stuffing a car full of batteries inevitably makes it very heavy (the I-Pace tips the scales at just over 2.1 tonnes), which is far from ideal when it comes to handling. And sure enough, you really feel that weight shifting onto the outside wheels when you turn in to a corner at speed, especially on the more balloon-like tyres fitted to cars with 18in wheels. 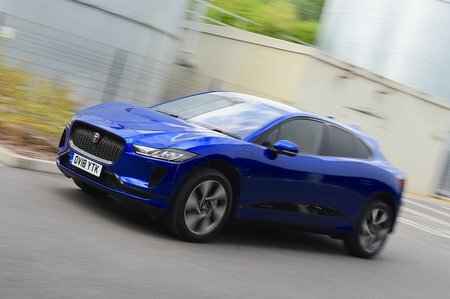 However, the I-Pace hangs on gamely to your chosen line – as long as you don't encounter a series of mid-corner bumps, which tend to upset its balance a touch. Push harder and you’ll feel the car gently run wide at the front in a safe and secure manner. Indeed, our only real gripe is that the stability control can be rather sudden in its interventions. It helps that the batteries are positioned beneath the floor for a low centre of gravity, and the I-Pace is claimed to have a perfect 50/50 weight distribution front to rear. Add in precise steering with just the right amount of weight to it, and it's decent fun for an electric vehicle. 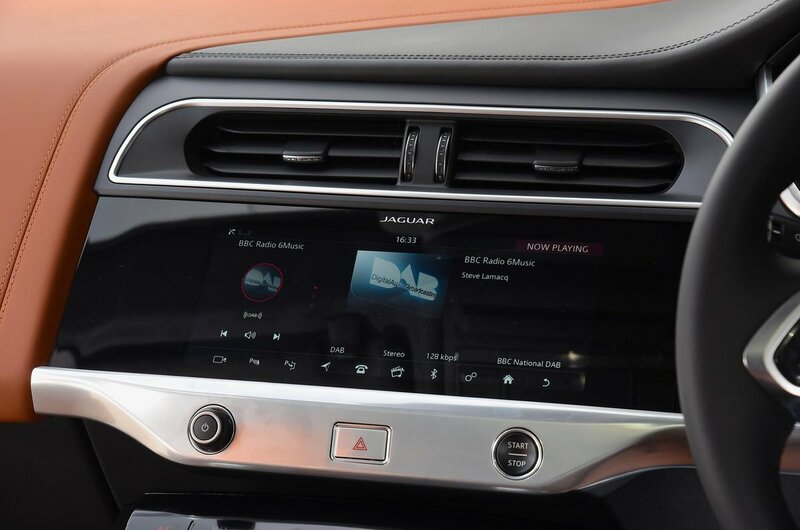 It’s even surprisingly capable off road, thanks to clever hill climbing and descent systems borrowed from Jaguar’s sister company Land Rover and the fact that the optional air suspension is height-adjustable. As in all electric cars, regenerative braking captures some of the energy that’s normally lost when you lift off the accelerator. 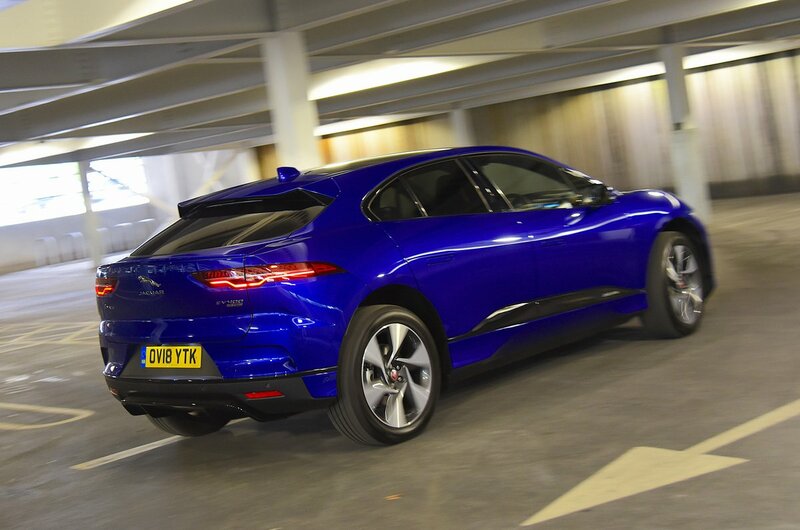 But when you turn the I-Pace’s to its maximum setting, the effect is so strong that you find you rarely have to touch the brake pedal at all. That’s handy, because the resistance in the brake pedal feels inconsistent and strange pulses and vibrations frequently pass through it, which can make it hard to slow your progress smoothly using the brakes. Fortunately, despite its sharp accelerator responses and stunning performance, the I-Pace makes it easy to pull away smoothly because its power delivery is nice and progressive. Road and wind noise are generally well contained, especially on the test cars we've tried that are fitted with laminated side windows. And depending on how vigorously you drive, the electric motors are either near-silent or make a sound like the Starship Enterprise going into warp speed. Secret Trekkies might enjoy this feature, although it's probably not advisable to demonstrate it on a first date.